After a rocky season due to injuries, Edmonton Oilers prospect Ziyat Paigin decided to move overseas to sign a professional tryout (PTO) with the Bakersfield Condors. In this translated interview, originally appearing on the popular Russian website Sport-Express, Paigin talked about his American Hockey League debut, the reasons of his move overseas and his plans for the future. Alexei Shevchenko: How did you like your debut? Ziyat Paigin: Everything was simply great. We played at the big Austin arena, there is basketball here tomorrow, and then we’ll play again against San Antonio. I am very happy. There were 8,000 spectators on the stands. AS: That’s more than what you had in the VHL. ZP: It’s even more than in [the KHL] with Ak Bars [Kazan]. I couldn’t even imagine that so many people would attend an AHL game. AS: In your first game you had a penalty and were minus-1. ZP: It was hard at the start, I can’t deny that. Small ice. I understood right away that you simply cannot get your head down. But I got into the game quite fast. About my penalty, yes, I still pushed my opponent into the boards. The goal was a strange one, but since I was on the ice, then I was to blame. AS: Are you familiar with any of the players in your team. ZP: Not really. But the guys are positive with me, they help me a lot. I know some English, but I can’t say that I can freely talk. I understand something, but not everything. I’m gonna stay here in America once the season ends so that I can pick up the language and understand how things work here. AS: What are your plans? ZP: I’m planning to spend here the next couple of years. I need to do a step forward in my development, and I need to step up on a new level. AS: In Edmonton, it can be said that it’d be harder for forwards, than for defensemen. ZP: I studied the team’s roster, watched their games, and I think that I have a chance to play in the NHL. But it’s up to me. AHL coaches are very helpful, but no one else is going to make things easier for me. AS: In the AHL stats don’t track ice time. Do you know how much you played? ZP: A lot more than what I recently played in Kazan. ZP: We started playing with six defensemen, then to five, and then another player was injured, so we finished the game playing in two defensive pairs. I didn’t play with the man advantage, but I played a couple of shifts of penalty killing. I think I played pretty much as I was playing with Bars in the VHL. AS: You were assigned down to the VHL after an injury. ZP: And what that injury was? If you remember, I was hit by a puck in the unprotected part of my knee. The ligaments were not torn but were damaged. I couldn’t bend my leg for a week, but after a month I was fully healed and could start playing again. I didn’t have any problem. AS: But you didn’t play in the KHL. ZP: The coach didn’t feel like I was ready. 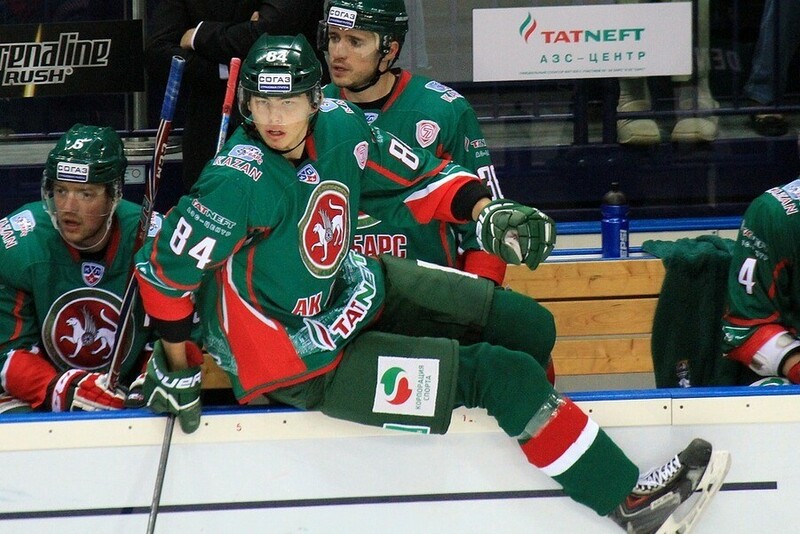 I discussed it with [Ak Bars Kazan’s head coach] Zinetula Khaidarovich [Bilyaletdinov] about this, and I was told to work and get in better shape. I nodded and promised to work and train. I did everything I was asked to, but I didn’t play in the playoffs. AS: During Friday’s press conference, your coach said that you weren’t in good shape. ZP: So, that’s what they think. AS: And you didn’t want to sign a new contract. ZP: Now I’m gonna tell you what happened. At the start of the season, I was offered a new contract. But I was completely disappointed with the proposed conditions. For example, to me, three years was a lot of time. I asked for some reconsiderations, but we didn’t talk about it anymore. AS: So you didn’t sign a new contract, and you were excluded from the team. ZP: Well, that’s your conclusion. AS: You somehow tried to persuade Ak Bars to let you stay in Sochi, where you were playing great. You had a lot of ice time, power play time, and points. ZP: You remember correctly, but players of my age have no choice. I get told go to Sochi, and I go. I get told to get back to Kazan, and I get back. You’re not going to get asked about your wishes at this age. ZP: I could say how much I wanted that I was happy in this or that team, but I had a contract. AS: It’s surprising that Russia from one hand is trying to get back as many players as possible but from the other hand kind of pushes young players overseas. ZP: I think that other young players can get to conclusions from my experience and autonomously decide for themselves. AS: Are you ready to long bus trips? ZP: (Laughs). I played a long time for Bars in the VHL and it was the same. Therefore I think it won’t be a problem for me. I am not paying attention to such details, I have a goal and I’ll do what it takes to fulfill it. After a short holiday, I’ll start to workout, I’ll attend the rookie camp, and in general, I’ll be working a lot. This year will “eat” one season from the rookie contract, so I’ll have another two. It makes no sense to view things in such a long term. AS: Where did you set down in Bakersfield? ZP: I’m yet to see the city. I went right away to Austin, where the team was going to play.